Handy Andy is a quilt block pattern that explains how to make a large version of this traditional patchwork design. The quilt block is assembled with a combination of plain squares and quick-pieced patchwork units. Rotary cutting techniques help you sew Handy Andy quickly and accurately. Finished quilt block size: 20" x 20"
I've used the quilt block on the left to color-code the cutting instructions but choose any color theme that suits your needs. I also split the cutting for red half-square triangle units and quarter-square triangle units to make it easier to choose two different fabrics from your scraps. Red for half-square triangles, a strip that's about 5" x 11"
Blue for half-square triangles, a strip that's about 5" x 21"
Red for center square and quarter-square triangles,: a strip that's about. 5-1/2" x 15"
Take a look at more big quilt block patterns. 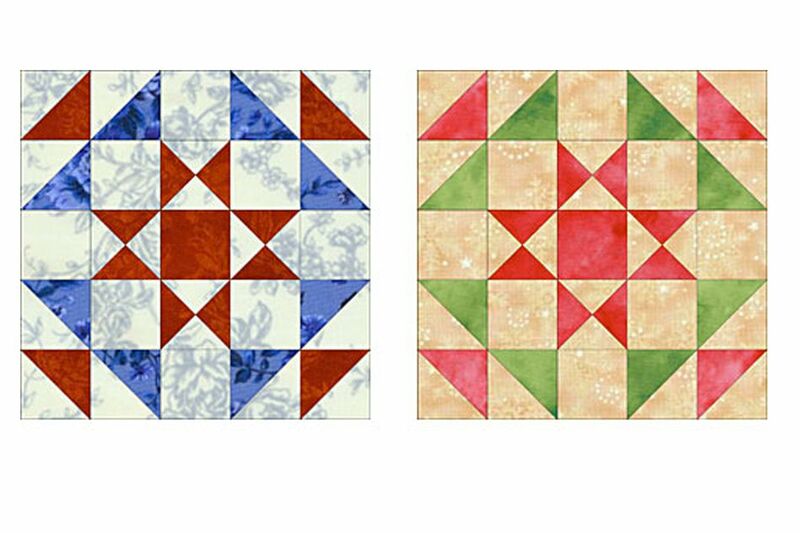 Quick piecing methods make it easy to sew half-square triangle units and quarter-square triangle units. Refer to both methods linked below if you haven't used the techniques. Using the half-square triangle quick-piecing instructions linked above, sandwich a 4-7/8" background square with a 4-7/8" red square to make two half square triangle units. Each should measure 4-1/2" square when complete. Repeat to combine another background square with a red square of the same size. Use the same method to construct eight half-square triangle units from the 4-7/8" blue squares and the background squares of the same size. Sew half square triangle units by combining the 5-1/4" background and red squares. Refer to the quarter square triangle unit instructions to turn the half-square units into four quarter-square triangle units. Each completed unit should measure 4-1/2" square. Arrange the block components into groups as shown in the lower left of the illustration. Use a quarter inch seam allowance to sew each grouping of units together. Press seam allowances towards rows with plain squares when possible. Sew the top components (4-piece corner clusters and a narrow vertical) together. Sew the bottom components together. Sew all rows together to complete the quilt block. Press. The Handy Andy quilt block should measure 20-1/2" x 20-1/2".